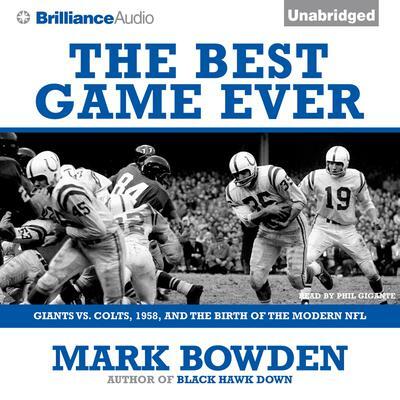 On December 28, 1958, the New York Giants and Baltimore Colts met under the lights of Yankee Stadium for that season’s NFL Championship game. Football, growing in popularity amid America’s post-war economic boom, was still greatly over-shadowed by the country’s favored pastime—baseball—but the 1958 championship proved to be the turning point for pro football. On the field and roaming the sidelines were seventeen future Hall of Famers, including Colts stars Johnny Unitas, Raymond Berry, and Gino Marchetti, and Giants greats Frank Gifford, Sam Huff, and assistant coaches Vince Lombardi and Tom Landry. Played on a freezing Sunday evening in front of 64,000 fans and an estimated forty-five million television viewers around the country—at that time the largest crowd to have ever watched a football game—the championship would become the first sudden-death contest in NFL history. With two minutes left in regulation, Baltimore had possession deep in its own territory, and the ball in the hands of the still unproven quarterback Johnny Unitas. The Best Game Ever is a brilliant portrait of how a single game changed the history of American sports.